It’s been clear to me and to Angela for a while now that it would be a really good thing for the girls, in particular for Mara, to have quality time alone with me — adventure time with Daddy. Time that validates their intense but easily overlooked existences as children who wish and need to be observed, regarded and communicated with by their father. They occasionally get a species of this time when I grab one or the other of them to dash out and get some groceries or run some other errand, but these events are always besmirched for them by the discovery of something they’d like me to purchase for them and the ensuing argument in which I restate the purpose of the trip, which doesn’t include buying impulse items. It’s not the same as an outing made for the express purpose of doing something fun together and without the older or younger sister, as the case may be. 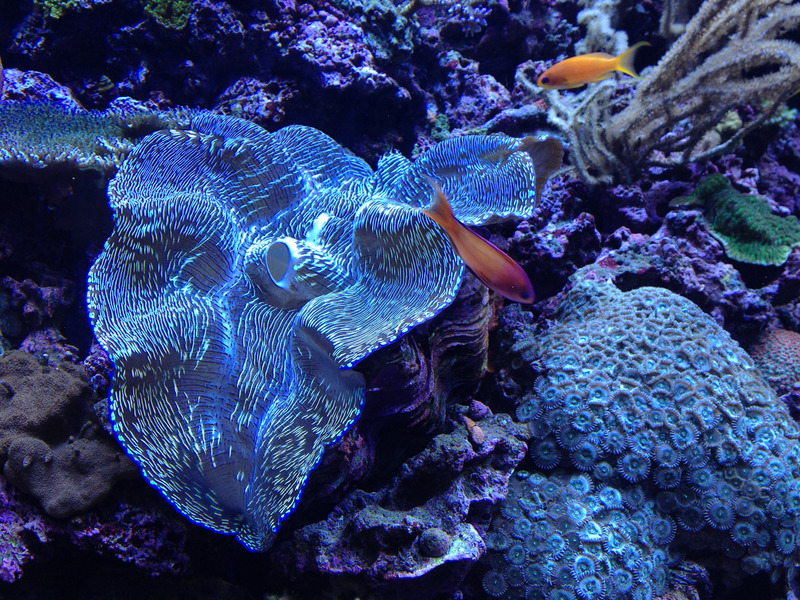 This is a yuge clam. It’s the size of a breadbox, exactly. It is relevant later in this post, but I put it here to catch your eye, as it did mine. The movies that Mara wants to watch are too scary for our sensitive Millie, who crawls onto my or Angela’s lap (or behind our backs) at the merest hint of danger or hostility in family-rated screenings. So Mara frequently watches Curious George or Richard Scarry’s Busytown Mysteries instead of the more relational preteen dramas she craves. And to her lights, this is just the tip of the iceberg. EVERYthing has to be chosen with Millie’s sensitivity, or bedtime, or menu preferences in mind. I realized earlier this summer that I needed to get Mara out on a canoe trip or a bike ride or to a movie or something, just a few hours dedicated to doing something with her that did not have to be a compromise with the needs of her little sister. But we’ve had such a busy summer full of fun weekends — little outings as the whole family to places around the region — that I simply have been unable to schedule anything like this. I purposed to get Millie out by herself, too, though Millie does not need exactly the same thing in Daddy-time. She’s still “just little” and does not feel the preteen confinement that Mara sometimes does — she loves playing with her older sister and does not really ever tire of it — but she is approaching the end of a long cling-to-Mommy phase and seems more desirous of relating with me. Last weekend, I finally had time to take Mara out, and while she initially said renting a canoe would be fun, she chose a long bike ride in the end. Because we live on a steep hill, practically a cliff, the girls cannot just go outside and ride bikes, except in the sixteen level feet we get if we move the car out of the garage. Otherwise we have to take them somewhere, and that means rigging up the bike rack to the back of the car. And when we’ve done that we’ve also brought Millie’s scooter or trike or training-wheeled-bike along, too, which means slower going wherever we go. So even though Mara has been able to ride for years, she has never been “out on a ride” around here. It was a sunny day. A sunny hot day. 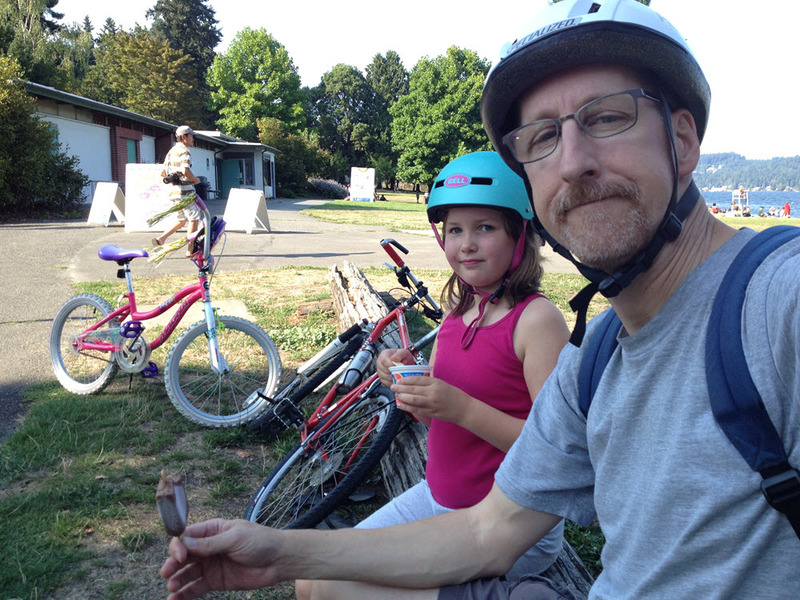 We put the rack on the car and the bikes on the rack, and drove over to Lake Washington and parked near the Burke Gilman Trail, which is an old railbed of the Seattle, Lake Shore and Eastern Railway. It was turned into a jogging and bike path years ago and expanded, and now runs all the way from the Shilshole Bay on the Puget Sound out around the north end of Lake Washington and on to Woodinville on the Eastside. I don’t even know where it ends, maybe in Redmond somewhere, and if it goes that far then it probably connects to a similar rails-to-trails easement along the east shore of Lake Sammamish and then on up over Snoqualmie Pass. Basically, I guess, it goes to Boston. Anyway, we got on this trail and rode for almost three miles and back again, taking it easy and saying “on your left” to pedestrians ahead. My bike is a good one but it’s been in the garage for a decade and a half while my buttbone has been in a soft chair, so I was sore within five minutes and I was grateful that Mara asked to stop for water every five minutes. Mara and I caught up with the popsicle truck at Matthew’s Beach. Still we had a great time, except for the little snag we hit when two ladies walking a tiny, irritating dog were not paying any attention to the fact that it kept trippity-tripping across the trail, directly athwart the path of cyclists. I managed to swerve around the feckless yapper in a moment when it was at perigee to its owner, but it swung out again in front of Mara just as a team of serious neon-and-smart-fiber cyclists were approaching the other way at Mach I and another group was speeding up behind us. Mara bailed off to the left in front of all of them — suicide, but what else could she do — and managed to get into some grass on the other side just before all the supercyclists slowed into a knot of wobbling and swerving and loud huffing in that self-righteous way of serious cyclists and the offering of suggestions about dogwalking on a bike path to the woman who sauntered along talking to her friend and taking no notice of the near-multideath accident unfolding at the other end of the leash. Today it was Millie’s turn. She wanted me to take her to the Seattle Aquarium and we’ve been looking forward to it all week. (Sweetheart that she is, though, and in perfect breach of the purpose of Millie-Daddy Time, she suggested that maybe Mommie and Mara would want to come, too.) We rode downtown on the bus, which is part of the fun, although she did fall asleep about a block before our stop — it’s just something that happens to her when she’s in any vehicle for very long; her eyes roll forward and her head falls back and she’s out cold. It was drizzling lightly (drizzle, that’s one of the northwest’s words for rain, like a particular kind of snow to Inuits or a type of sand to Berbers) and there was a bit of a cool breeze, but it was otherwise a not-cold cloudy day, just perfect for walking along the waterfront for a while and then getting out of. We stopped to get a latte for me and an Italian soda (raspberry, with cream but no whipped cream) for Mills. The highlights at the aquarium were the giant Pacific octopusses, one of which was very active and the other, whom we heard called “Delilah” by the docent, was asleep; the touching pools, where I held Millie up so she could reach all the way to touch the anemones and other non-dangerous tidal critters — one finger only please; the seahorses (for Millie) and the cuttlefish (for me); the bright and exotic tankfuls of reef-dwelling fish and eye-bogglingly beautiful giant clams; and across the wharf the puffins (for Millie) and the at least 40-year-old sturgeons (for me); and finally the harbor seals and otters — both sea otters and river otters, what Millie remembered later as “stream otters”, which were curled up like cats and sleeping. All that viewin’ made us powerful hungry, and we dashed over to Red Robin for a bowl of mac ‘n’ cheese (for Millie) and a burger (for me). 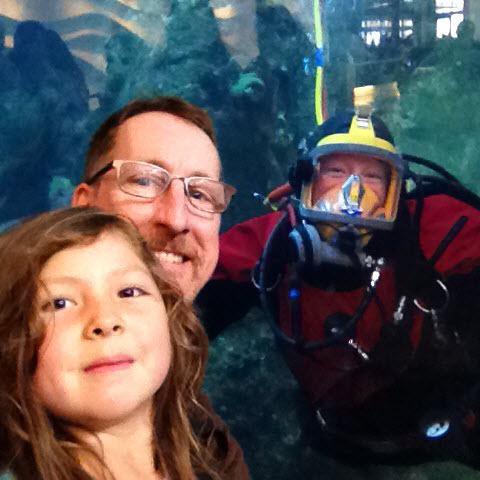 A scuba diver at the aquarium obliged us by posing with us for a selvesie in the big tank in the lobby. Millie and I are holding our breath. Both of my daughters are at periods in their development where they are more interesting than ever to listen to and engage in conversation, and I cherish their company like nothing else in the world, but it’s a lot easier to focus and enjoy it one on one. Hopefully we can fold more Mara-Daddy-time and Millie-Daddy time into our routine more often. I live on (let the reader understand). So, on we go, merrily as we can, gratefully as we must. My parents started taking my sister and me, and eventually my little brother, to visit “the mountain” when we were very small. 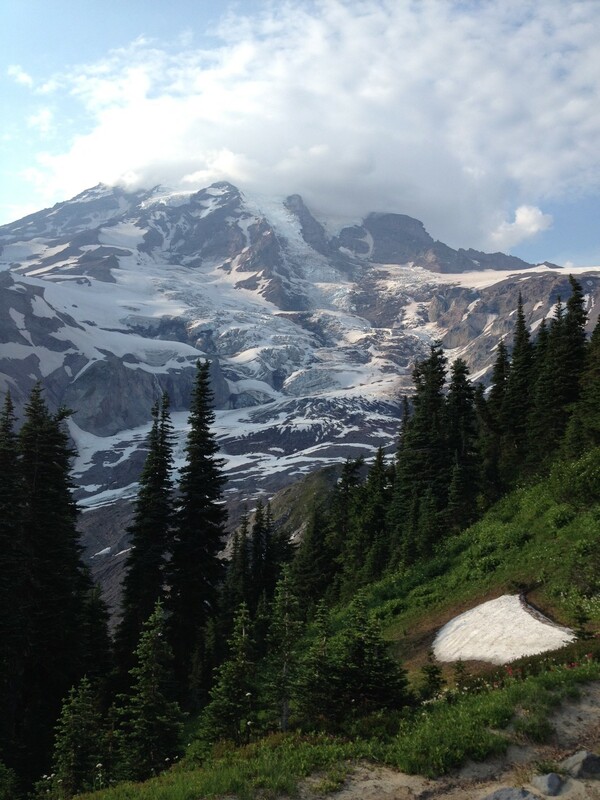 Mount Rainier is a two or three hours drive to the south of Seattle. One of my earliest car memories — no doubt a pastiche cobbled from many journeys there — is of Jeni and I inventing a song that went “Mount Rainier is coming out to play! Mount Rainier is coming out today!” and singing it over and over as Dad piloted the old station wagon up the winding, sunbright road that hugged the shoulders of the mountain on the way to Paradise Lodge, or more rarely, Sunrise on the more remote north side. It was more of a tuneless cheer, really, and another one like it went “Waterfall! Waterfall! I see a waterfall!”, which we trumpeted each time the car passed one of those sudden splashing cascades that come down to meet the road’s inner edge. Mount Rainier. My sister thought of it as home. I remember picnicking somewhere on the way to Paradise, at sturdy wooden tables next to a parking lot. The tight curve and stone bridge at Christine Falls told us we were nearing our destination. We might stop at Narada Falls, too, where Paradise Creek tumbles over a stubborn installment of ancient granodiorite, having eroded away the younger andesite to form the ravine. And finally, the old lodge with its amazing high-ceilinged interior of polished logs and its gift-shop full of trinkets, mugs, and Indian-reminiscent wares. My folks once bought me a little wood-shafted spear there with a rubber tip and some colorful feathers. The lodge was always so dark inside because it was so blasted bright outside. Across the broad parking lot — blisteringly hot and yet caressed by often icy breezes — was the swank visitor’s center, the old circular one with its second-floor observation deck and interpretive center for combining an understanding of Rainier’s fourteen living glaciers with stunning views of three or four of them (Kautz, Wilson, Nisqually,…), right outside the big windows. The old visitor center. Apparently everyone hated it, but I never got that memo. Photo swiped from online somewhere. I remember being there at times when snow still lay 15 feet thick around the parking lot, when you had to enter the visitor center and the Lodge — and more importantly, the pointed chalet-style bathrooms — under the snow through a tunnel that looked like a large section of corrugated tubing. We were also there many times when only little patches of snow remained in shady north-side dells here and there and the meadows were full of brightly-colored flowers — flowers I didn’t pay much attention to then but now know to have been lupines and daisies and Indian paintbrush and avalanche lily, among others. When they were not covered in snow, we hiked up the trails that led steeply from the lodge up among the clumps of alpine fir along the ridges, to where the views of the glaciers were even more impressive. 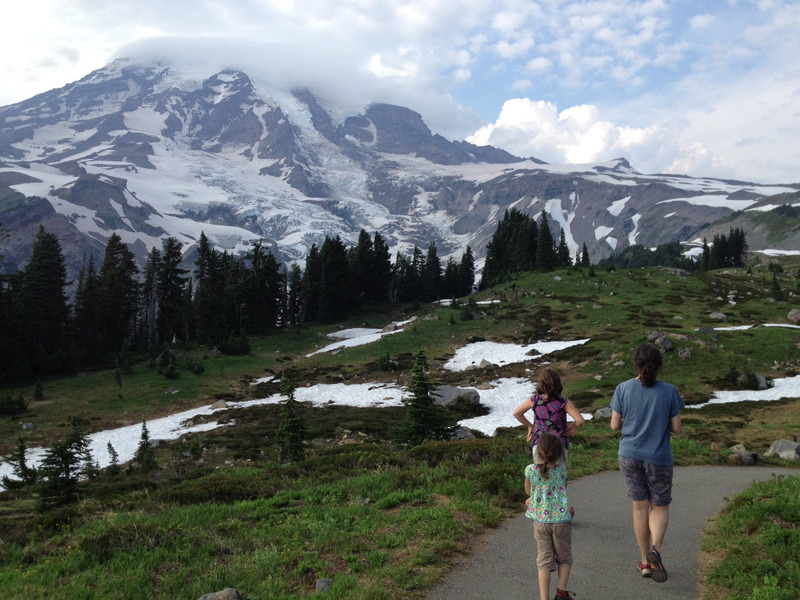 When family members came from the East Coast, we took them to Mount Rainier. It seemed to me that we went there a lot. 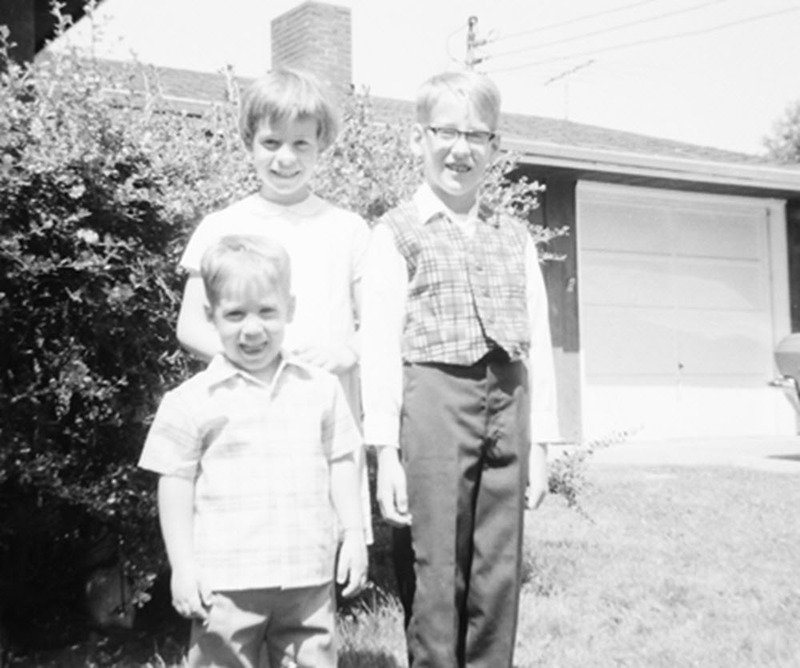 There is, I’ve just now thought of it, a photograph somewhere, an old black and white one with the white border, that shows myself and my sister Jeni — this was before Ben was born — with a kneeling young woman in a bright blouse and dark shorts. I used to look at the picture and think the woman was our mother, because it looks just like her. But it is Aunt Cindy, Lucinda May, my mom’s younger sister, who died of cancer only a year or two later. 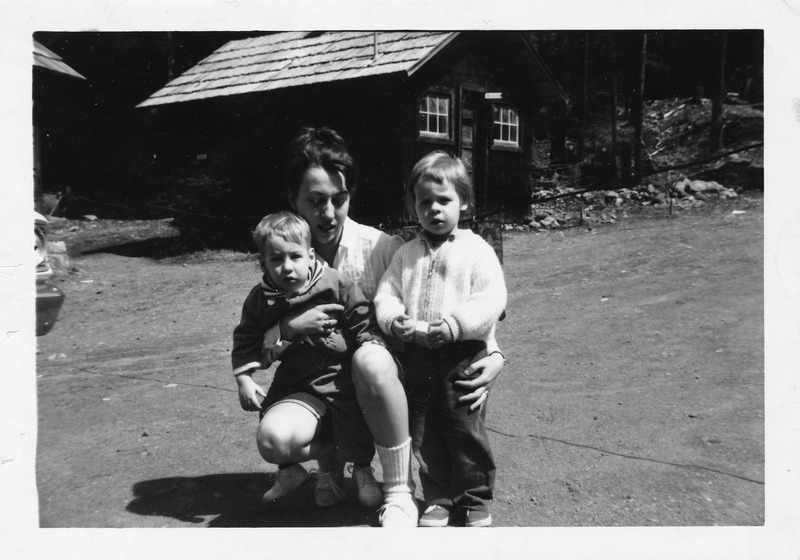 I don’t really distinctly remember her visit, but there we are, posing in front of the buildings at Longmire, which is a smaller lodge within Mount Rainier National Park. 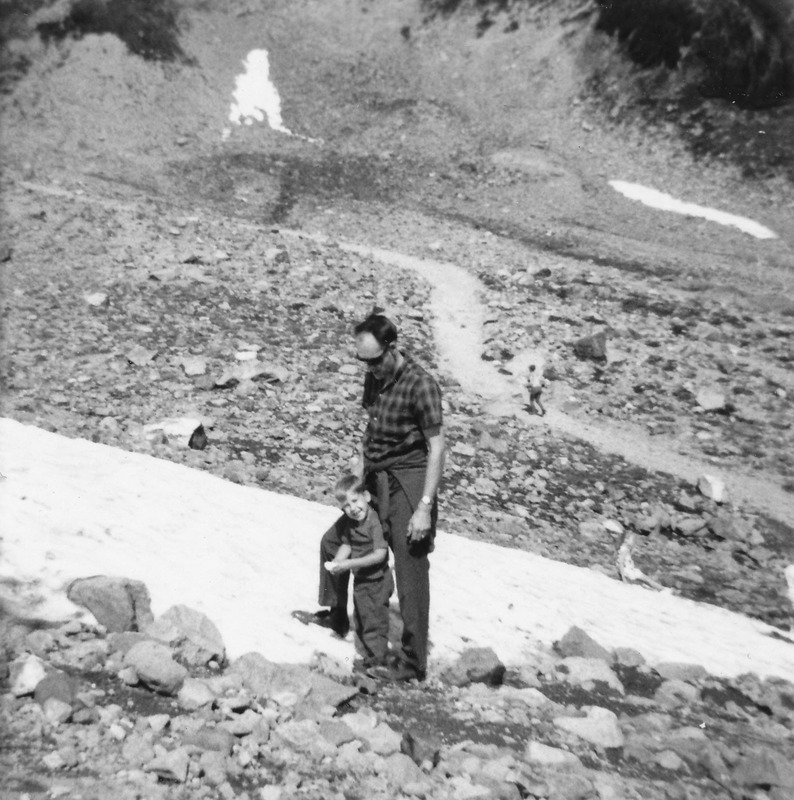 There’s another picture, one of my favorites from the old family album, of my dad and brother Ben standing in a patch of snow on a steep hillside. Ben is a toddler. Dad in baggy pants and a dark short-sleeved shirt is standing over Ben protectively, while Ben is patting a ball of snow he has just picked up, a look of delight on his face. I think it was his first experience of the stuff. Lucinda May, Jeni, Matt, on Aunt Cindy’s visit in April 1963. The metadata tag in my mind says this is at Longmire, but I don’t know why I think that. Dad and Ben, c.1968. I remember this photo as my little brother’s first experience of snow, but it may be just my brain making things up. This was on the mountain, on the trails above Sunrise or more likely Paradise. Click to embiggen and see the look of delight on Ben’s face. What’s spooky is that I’ve been looking at this photo for more than four decades and never before noticed that there are at least four humans in it. When I grew up I forgot about the mountain. Like everyone else in the Puget Sound area I saw it almost every day as I moved through my life, and I visited there a couple of times with friends in college, but mostly it became a thing of my past life. I also lost touch with my sister a little bit, since she had kids in her twenties and I was busy doing single things. As their children grew she and my brother-in-law Randy introduced them to the old rock and continued the family tradition of visiting it frequently. I never knew this. My sister and I hardly ever had a chance to converse in our adult lives. But after she died last year and our family drew together more closely than we ever had before, I started to understand that Jeni had instilled in my nieces and nephews a love and reverence for the mountain that approaches the spiritual relationship that the indigenous tribes have with it. To her daughters and her son, it is the spot on the earth that signifies “home”. As married adults, they now have their own memories of family trips to Mt. Rainier and they go there whenever they can. Millie being Millie at Christine Falls. 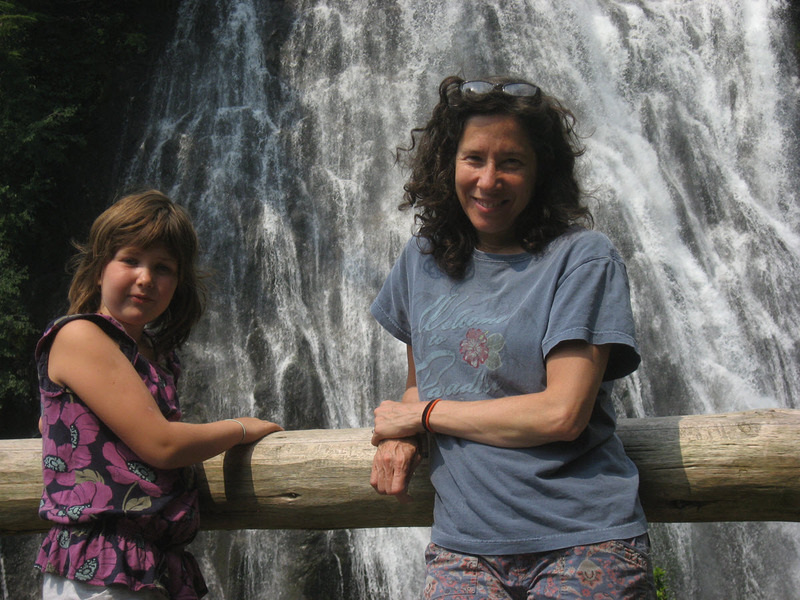 Mara and Angela enjoy a cooling mist at Narada Falls. 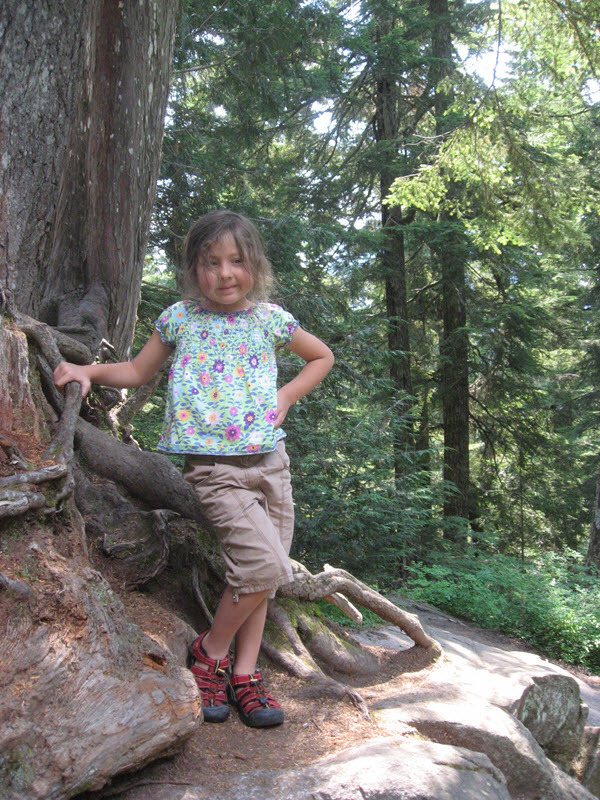 Last summer it occurred to me that Mara was eight years old and we had never taken her to the mountain, which seemed nothing short of a dereliction of duty on my part. Seeing the mountain as a hazy white hump between hills and buildings is not the same as standing on its flanks, as craning your neck to see its crisp white summit. I resolved that we would go in October, but the calendar got away from us and it didn’t happen. This year, I started planning for a visit in June, but the snow hung on through June and so the weekend we had set aside to go it would have been basically a long trip to a wet parking lot surrounded by 15-foot dirty bulldozed heaps of snow. We rescheduled and finally got to go last weekend, the first weekend in August. 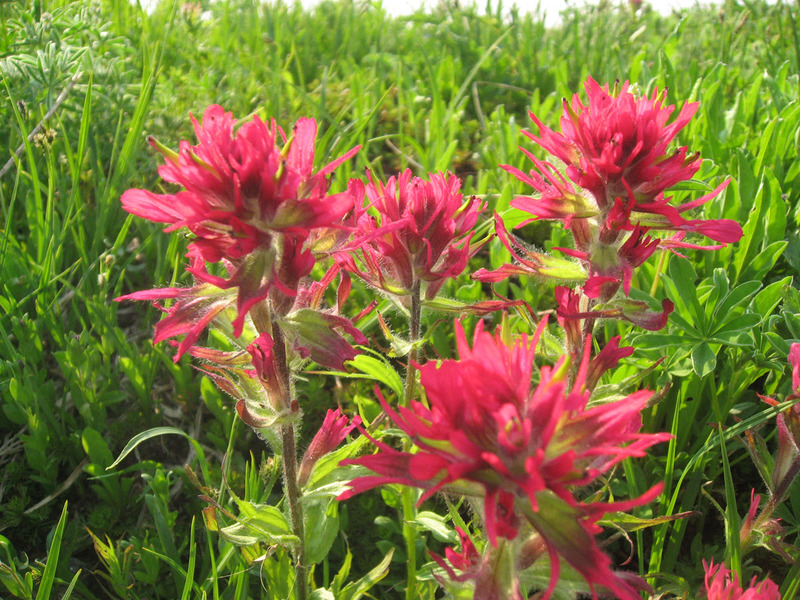 Paintbrush (Castilleja). I always knew this as “Indian paintbrush”. The girls loved it. We all did. 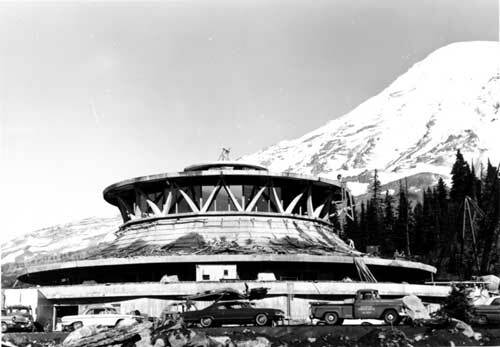 The Jetson’s-style visitor center I knew as a kid is gone, torn down and replaced by a new, smaller, steep-roofed woodsy one that more matches the style of the lodge buildings. Fine by me. 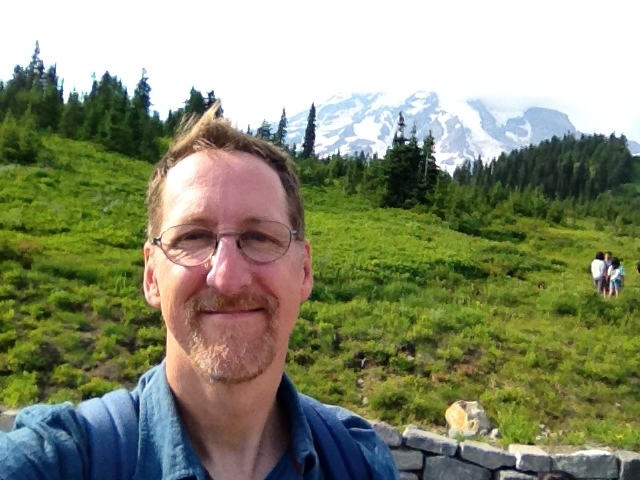 Everything else about the place was the same: the wildflowers and low-growing blueberry bushes, the steep trails (mostly paved now), the views across the valley to the Tatoosh Range of peaks, the honeyed stillness, the smell of subalpine fir (Abies lasiocarpa, if memory from my nurseryman days serves), the signs urging us to please not wander off the paved trails because the alpine meadows are delicate, and the big mountain itself, so vivid, so permanent, so unyielding, forbidding and inviting all at once. A volcano, as it happens. An active volcano that could go off at any time, like its sister Mount St. Helens did in 1980 a few valleys to the south and west, and lay waste all the cities and villages in the area. New memories in an old tradition. I was glad that my daughters got to experience it. To them, for now, it is just a day trip to this big ice-cream cone of a mountain they’ve seen in the distance for as long as they can remember. But the sights and sounds and smells will have made an initial impression, that first layer of mental sediment that will someday be a thick stratum of mountain memories that they will not know the beginning of. It was today, girls, this very day. A single day. We were all there together. I taught you the songs (cheers), and you sang them with innocent glee. My sister was there, too, I’m sure, either because part of her has always been there or because I took her with me in my old broken heart. If I live to awaken on August 14th I will be a different person in a kind of way. Sometime during the hours that comprise the preceding day there will come a moment when I will have lived 19,133 days. That’s how many days my older sister lived. Nineteen thousand, one hundred and thirty-three days. She was born 497 days before I was and she died on April 3rd of last year, so sometime on August 13th of this year, or perhaps the hours just around the edges of that day (I can’t figure it that precisely) it will become true of me that I have lived longer — first by a second, and then by several minutes, and then by hours — than the sibling who preceded me into the world. That morning, I will have crossed a psychological border into a territory that I was never meant* to inhabit or tread into or even see. In some ways — maybe in most ways — this is a meaningless thought exercise, just one more way for a naturally melancholic overthinker to punish himself for being such a bumbler as to lose a sister, to not fully appreciate and properly cherish a family member while she lived such that there would be no feeling of loss when parting time came, no missing. We can’t demand that every sibling drop dead after the elapse of a certain precise time span. And this happens all the time. In fact, Angela has the similar experience that she has now lived longer than her own mother did. It is nothing new under the sun. Moreover (really? have I become the person who says “moreover”? ), this day and this reality have no inherent significance for my little brother, who is just as bereft as I. The difference between Ben’s age and Jeni’s was a different difference, and if he survives me, as is my hope, the countdown that begins on the day I shed the coil to the moment he becomes the “sibling who has become oldest” will constitute a different number of days for him; 1,589 days in fact. So, yes, it’s ridiculous for me to dwell on this. I could with just these few thoughts dismiss the whole idea. But in another way, perhaps only to me, I think it’s the saddest thing in the world. I lose my place as the middle child, and my sister stops preceding me into my ages. I’ve been thinking about that day a lot (it almost goes without saying). About what I should do. It feels like I should do something, mark it somehow. Take the day off, maybe, although there’s no point in just having more time to be morose. Jeni’s grave is very close to where I now work. I could go there on my lunch break. Anyway, if God ordains that I should open my eyes next Thursday, the landscape I see will represent what I think is the final leg of my journey as my sister’s brother. I’ll be the second-born oldest child, for the rest of my days on Earth. Maybe I’ll stop thinking about death so much; maybe it becomes easier to see every single day as a gift, something extra, a special bonus opportunity that not everyone gets. *What is “meant” to be seems to me ultimately indemonstrable, but one could argue the point, and you know what I mean.